The photo shows ASR damage in a bridge supporting column. Slowing the deterioration of highway infrastructure, reducing carbon emissions, conserving resources, repurposing industrial waste—this Exploratory Advanced Research (EAR) Program project is pursuing multiple benefits through a unique experimental approach: Deterioration Reduction through Micro and Macro Crack Control (DRMC). The project, “Service Life Enhancement and Reduction in Carbon Footprint of Highway Structures” at the University of California, Berkeley, was funded by the Federal Highway Administration (FHWA) in 2010. Portland cement concrete is the world's predominant building material. Its durability, formability, and relatively low cost keep it in high demand worldwide, despite its deleterious effects. Concrete production is a major source of carbon dioxide and consumes vast amounts of energy, water, and other natural resources. End-of-life disposal of obsolete and failing concrete structures is costly and wasteful. Researchers have been working for several decades to reduce the environmental impact of concrete by incorporating waste materials, particularly recycled concrete and fly ash, in its formulation. In this EAR Program project, a promising approach may be key to widespread use of these materials to build longer lasting concrete structures that are safer for the environment. Efforts to reduce the carbon footprint of concrete through novel concrete mixtures have had mixed results. Fly ash, an abundant byproduct of coal-fired power generation, offers the opportunity to reduce greenhouse gas emissions when it is substituted for portland cement in concrete. Fly ash improves the resistance of concrete to alkali–silica reaction (ASR), a major contributor to structural deterioration, and increases concrete's durability. Although the compressive strength of high volume fly ash concrete can develop to exceed that of regular concrete, high volume substitution of some fly ashes delays the initial setting time and reduces the early age strength that is critical to meeting construction schedules and preventing drying shrinkage cracking. In this project, DRMC, a new performance-based materials approach to delaying and reducing cracking associated with mechanical and environmental loading, will be applied to concrete made with fly ash and recycled concrete aggregates. DRMC uses microfibers to delay the formation and propagation of microcracks and uses macrofibers to prevent further widening and spreading of macrocracks. The DRMC method has been demonstrated in a hybrid fiber-reinforced concrete (HyFRC) composite to promote superior crack resistance. The HyFRC mixture contains low volume fractions of polyvinyl alcohol microfibers and steel macrofibers. As described by Terry Arnold at FHWA, "It is hoped that this radical approach will reduce cracking, limit the entrance of water and corrosive pollutants, and slow and eventually starve destructive reactions by confining the products of ASR and corrosive processes. The DRMC approach is extraordinary in its apparent ability to reduce cracking regardless of its cause—whether that is shrinkage, mechanical distress, or expansive deterioration. This project will attempt to extend that benefit to concrete that utilizes recycled concrete as aggregate and high volume fly ash to replace 50 percent of portland cement." Phase I of the project began with evaluation of how well DRMC delays the initiation of ASR and corrosion damage in steel-reinforced HyFRC and control specimens under accelerated corrosion testing and cyclic loading. Phase II is subjecting the high volume fly ash/recycled concrete mixtures to similar evaluations. Additional tests with pre-cracked specimens will be conducted to isolate the separate effects of crack resistance and high volume fly ash on ASR. A unique feature of the study will be its use of motionless x-ray laminography, a nondestructive testing technique that enables researchers to characterize cracking around the steel reinforcement undergoing corrosion. 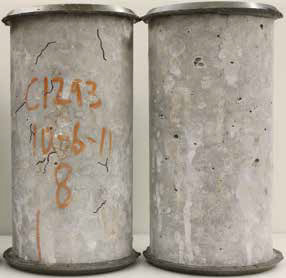 Although HyFRC demonstrates increased cracking resistance in portland cement concrete mixtures, it is not known how concrete containing less portland cement will respond to the multi-scale fiber reinforcement. High rates of portland cement substitution by fly ash may result in decreased pH levels, which compromise the protective passive film on steel reinforcement. The critical question is whether the material's crack resistance will suffice to prevent steel corrosion in the absence of the protective film. Two concrete samples using equivalently reactive aggregate. 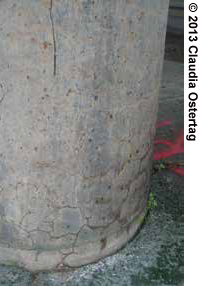 Left, ASRdamaged concrete with cracks marked; right, crack-resistant HyFRC for concrete strength and stiffness retention. "Achieving crack-resistance in concrete that uses less portland cement would open the door to greater use of sustainable materials in building and rehabilitating our highways and bridges and sharply reduce the environmental impact of these structures," says Arnold. "If this project succeeds, there will be many potential benefits—extended service life, reduced carbon emissions, conservation of finite resources, and productive use of material headed for the landfill." For more information on this project, contact Terry Arnold, FHWA Office of Infrastructure Research and Development, at 202-493-3305 (email: terry.arnold@dot.gov).